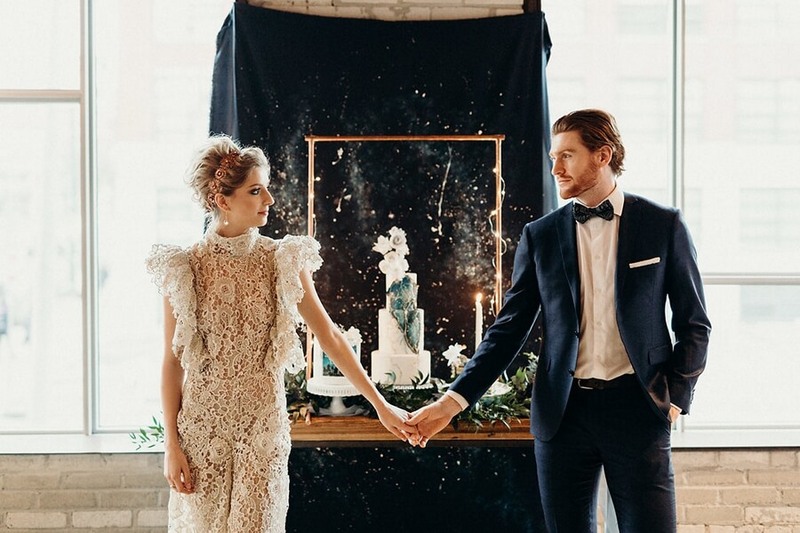 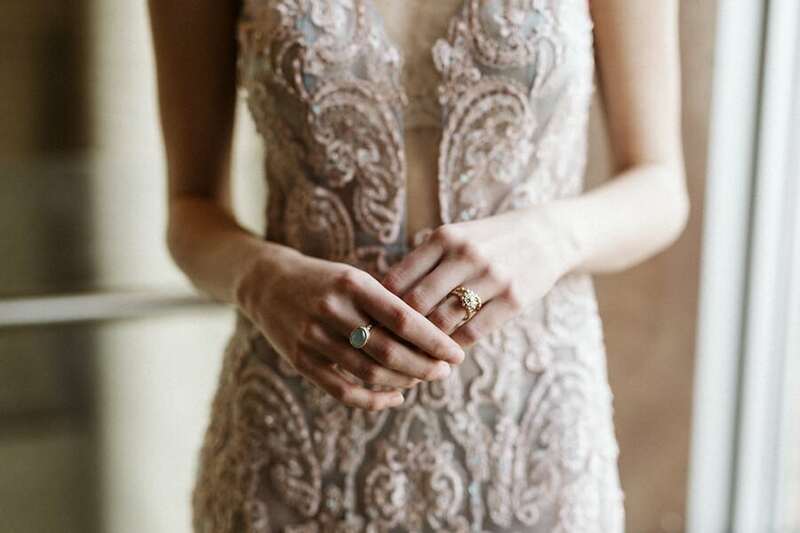 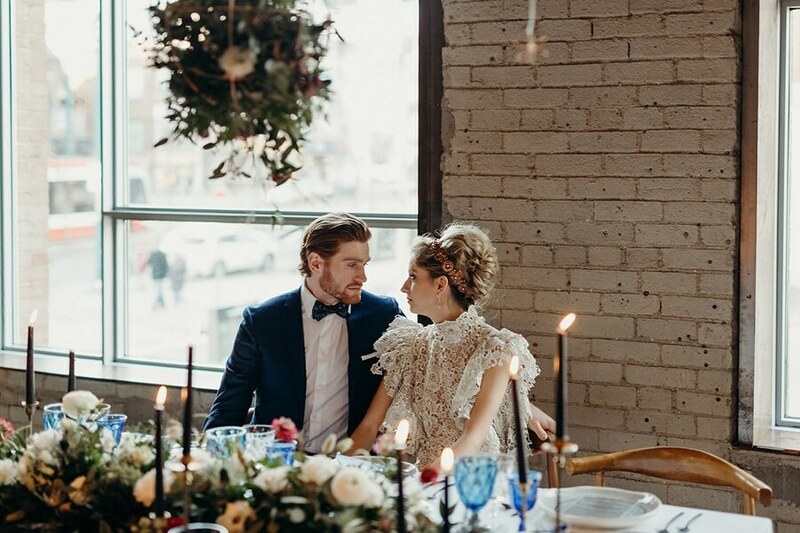 This gorgeous style shoot is inspired by the beauty of nature and the stars in the city. 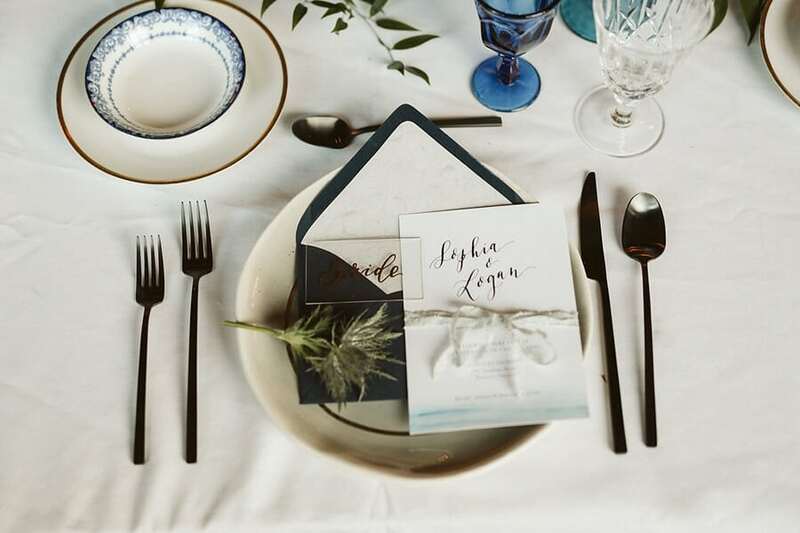 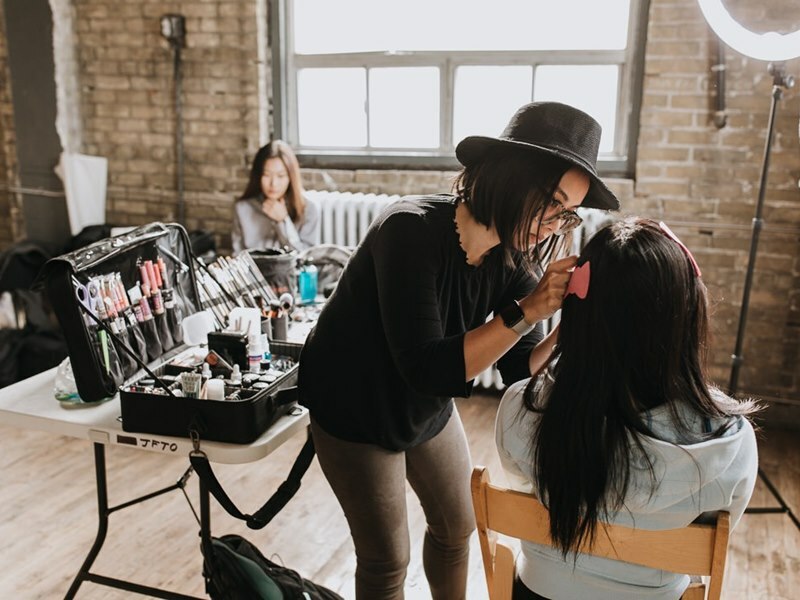 Working together, the creative team at Karin Wu & Co and photographer Marcucci Photography brought their story to life using a colour scheme featuring hues of blue, copper and black. 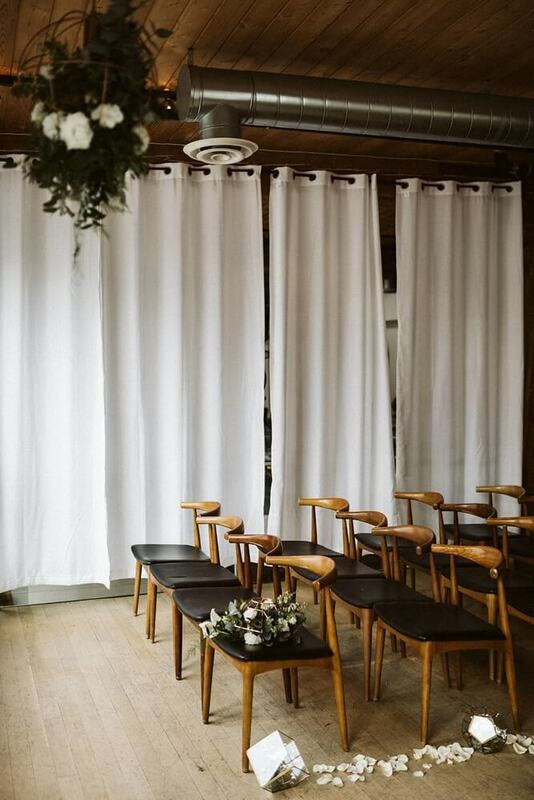 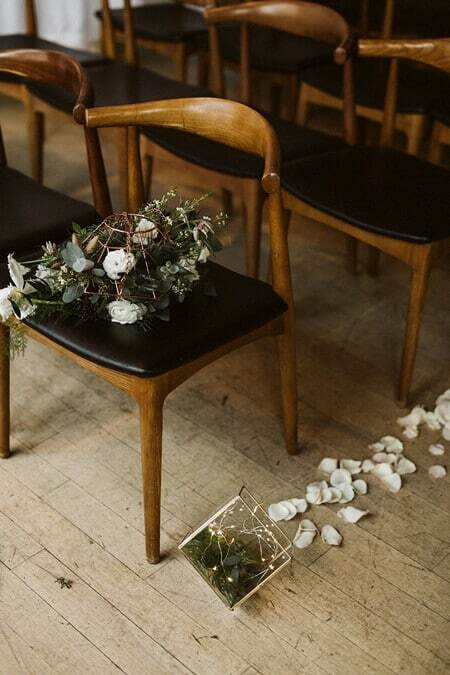 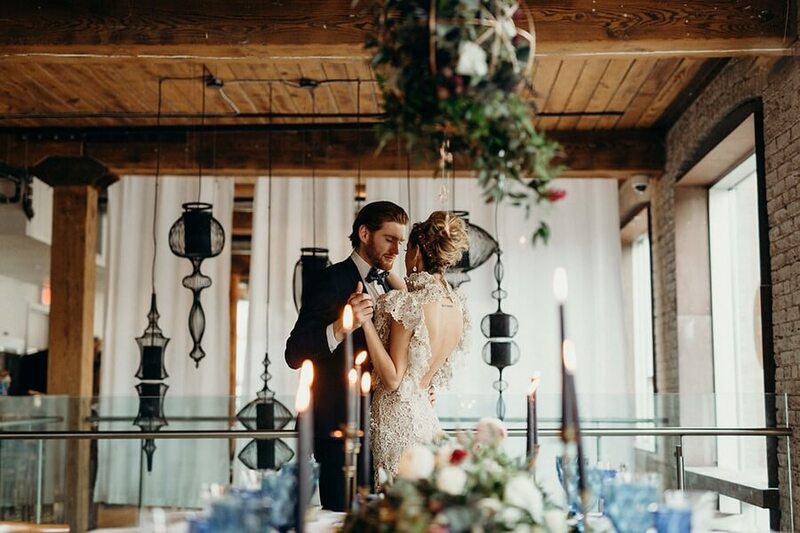 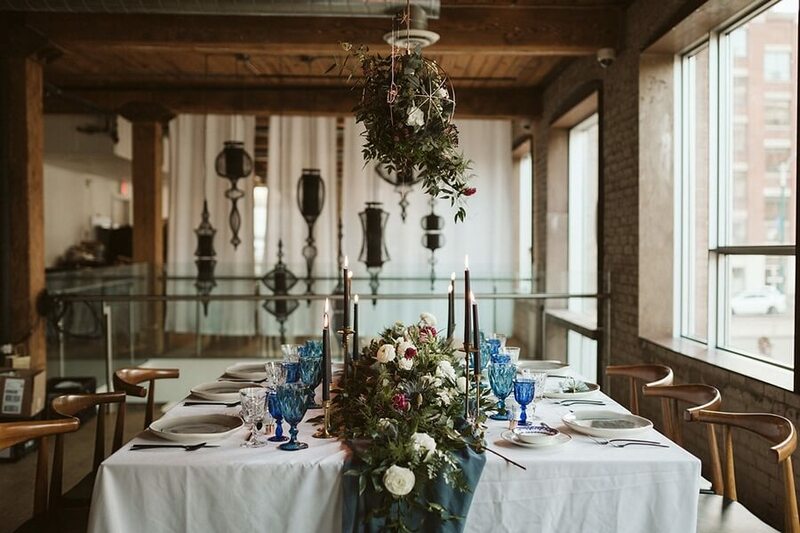 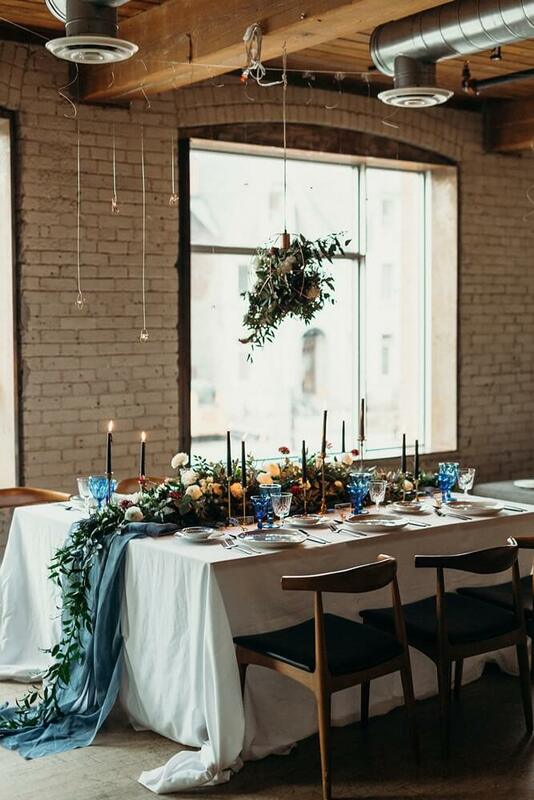 Envisioning an edgy and moody vibe mixed with an intimate ethereal ambiance, Hotel Ocho was the perfect choice for this shoot with its industrial chic style. 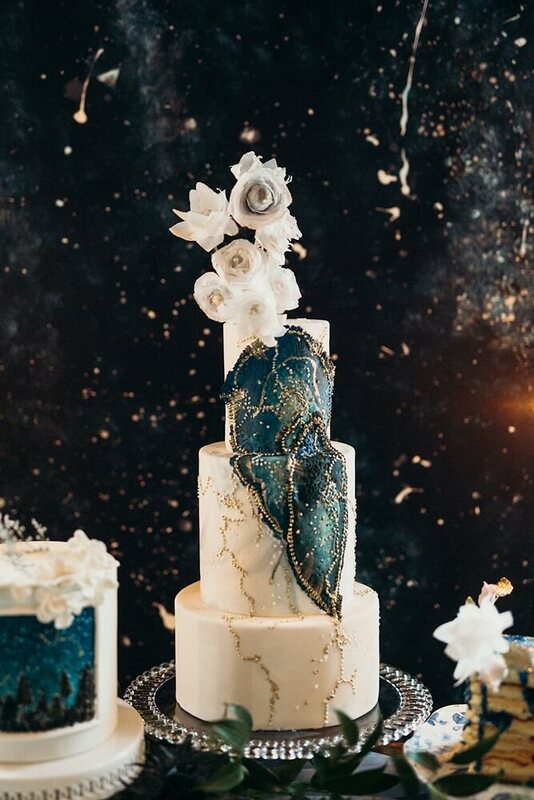 Keep scrolling for all the details! 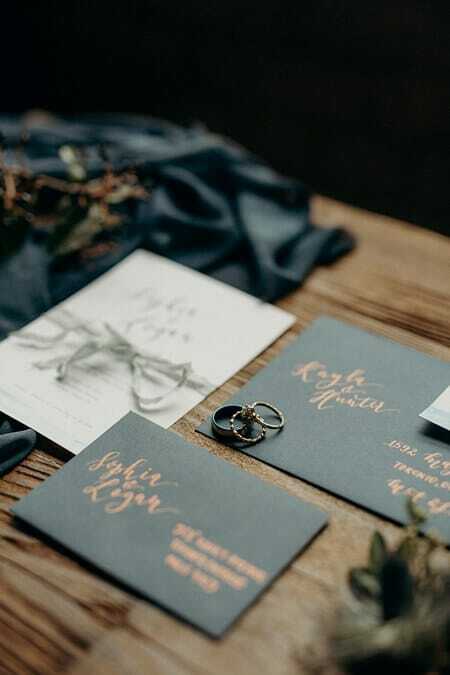 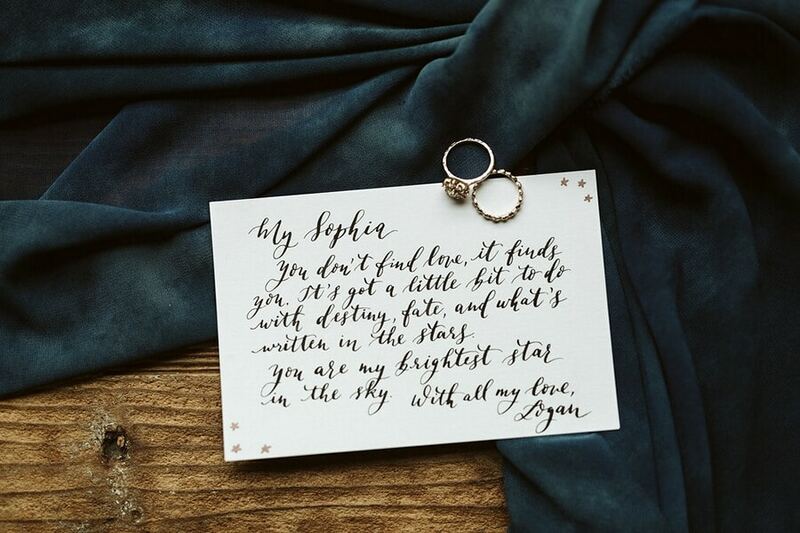 Cecile Lau Calligraphy‘s beautiful stationery uses contrasts of light and dark. 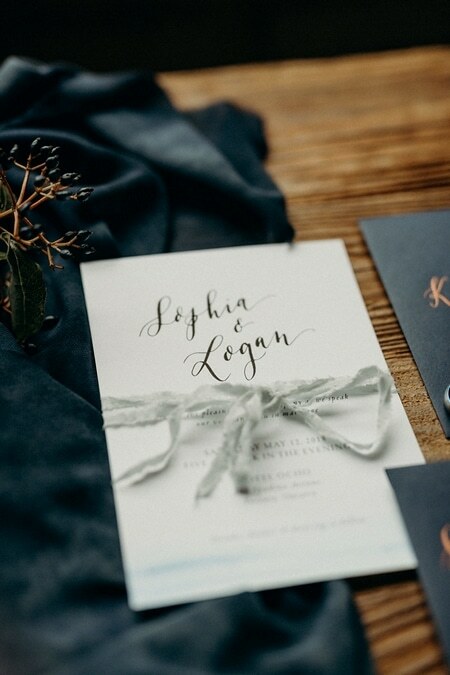 The invitations are white with dark calligraphy and the envelopes are dark with copper calligraphy to add a pop of colour! 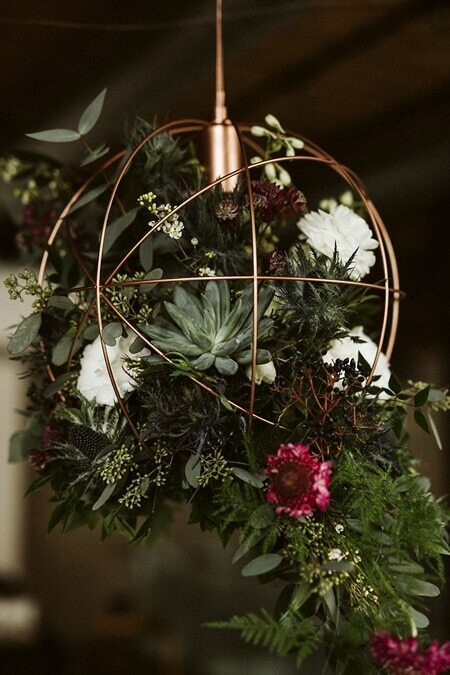 The floral-filled sphere chandelier and geometric shapes from Pine Flora are statement pieces that add a stylish, modern feel. 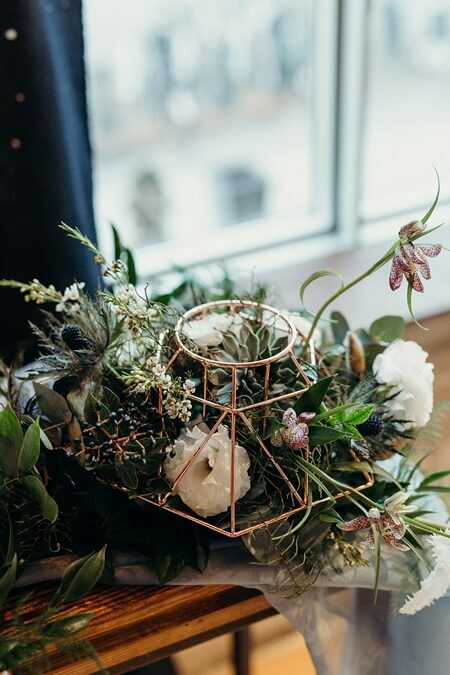 Along the aisles, the twinkling fairy lights in the terrariums look like constellations in the sky. 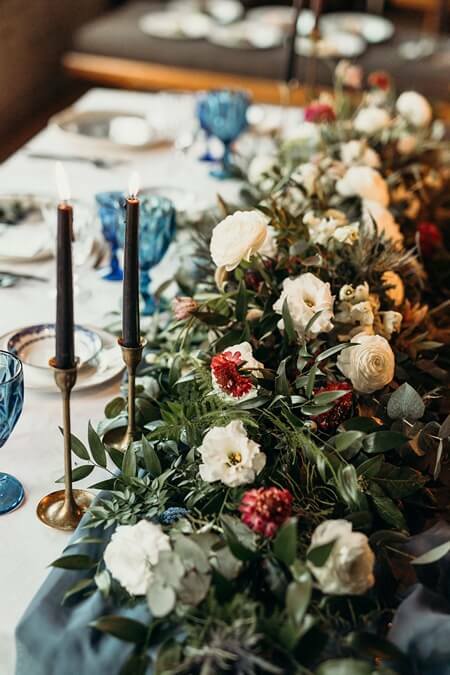 Hello Midge kept the florals simple with white and raspberry flowers and lots of greenery. 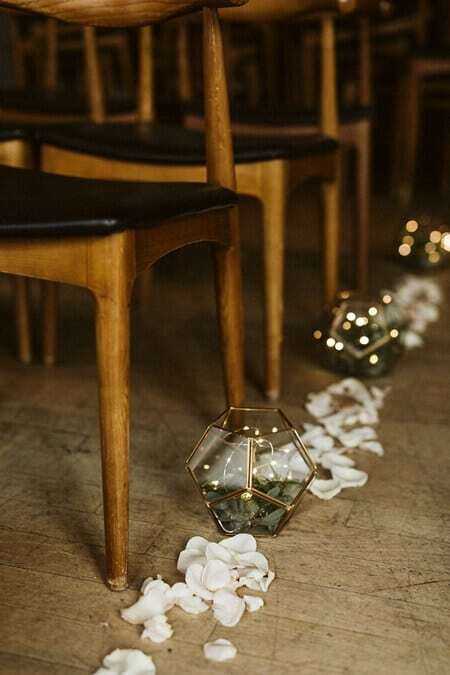 They are the perfect contrast to the trendy, copper geometric shapes. 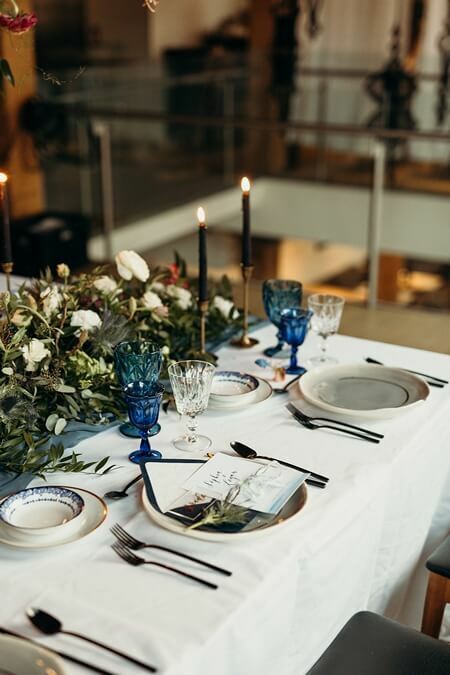 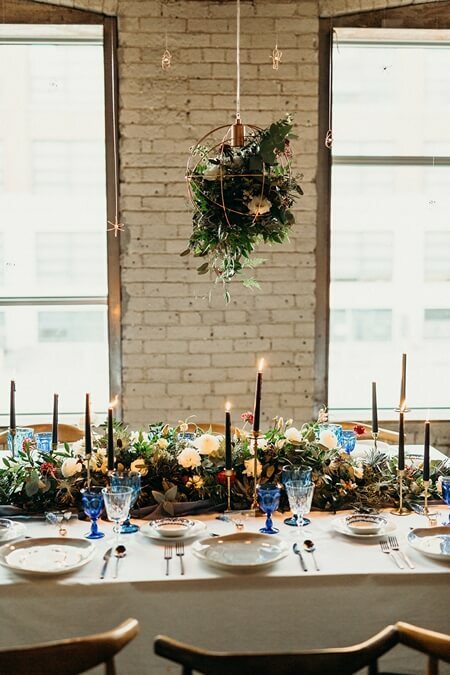 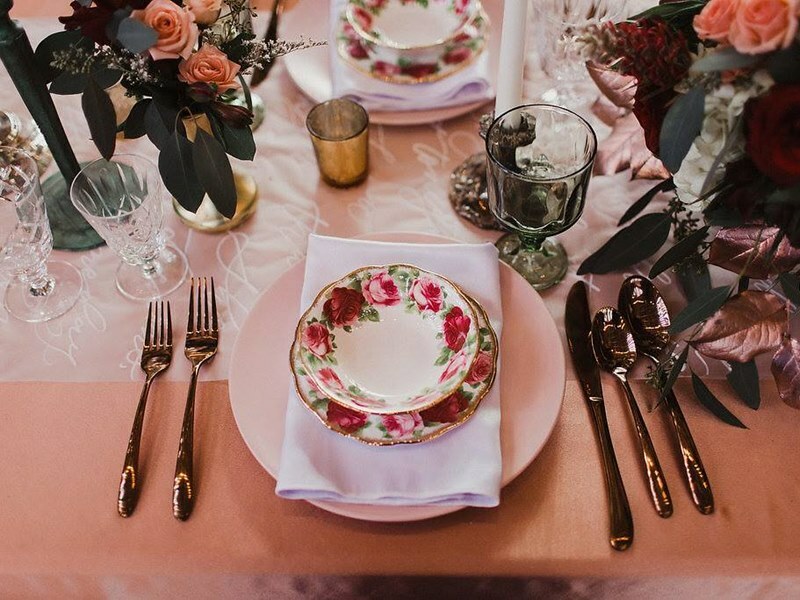 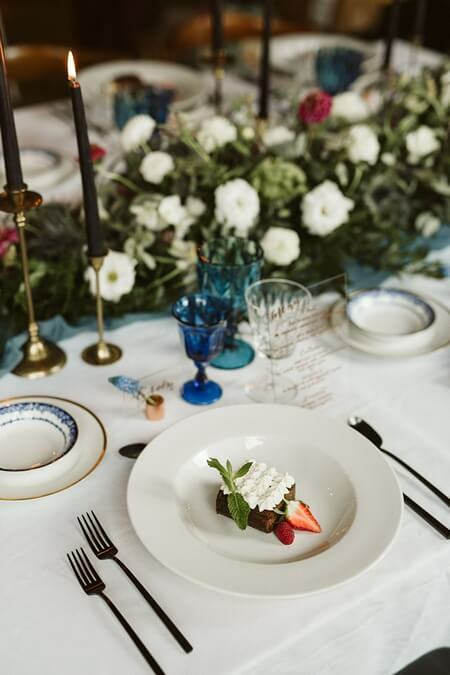 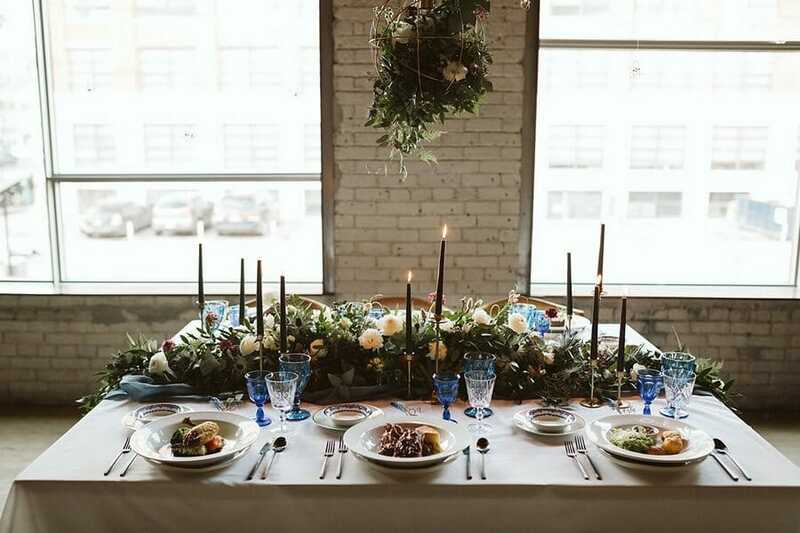 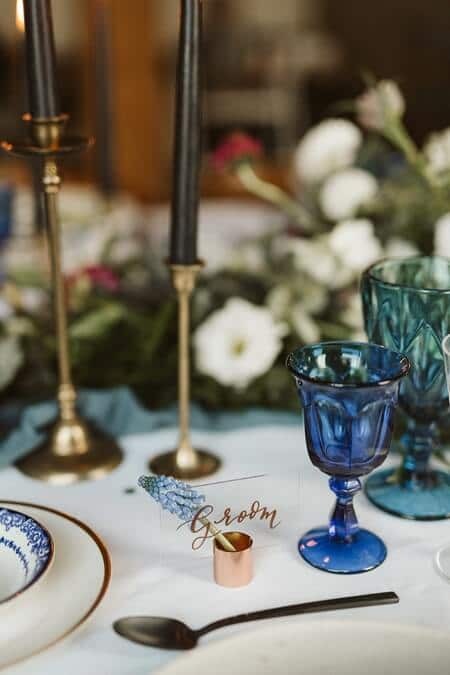 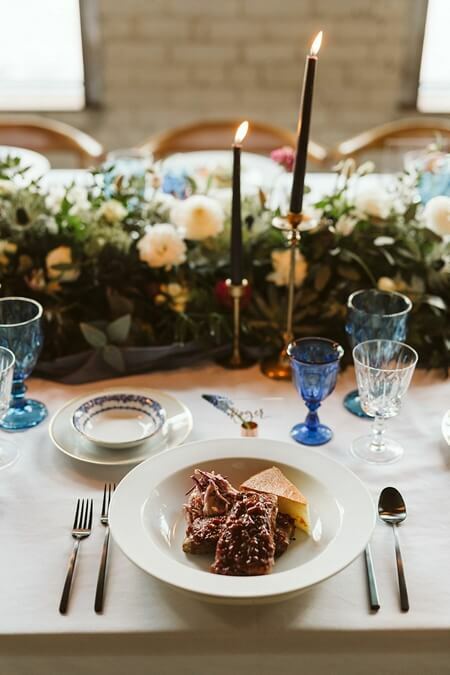 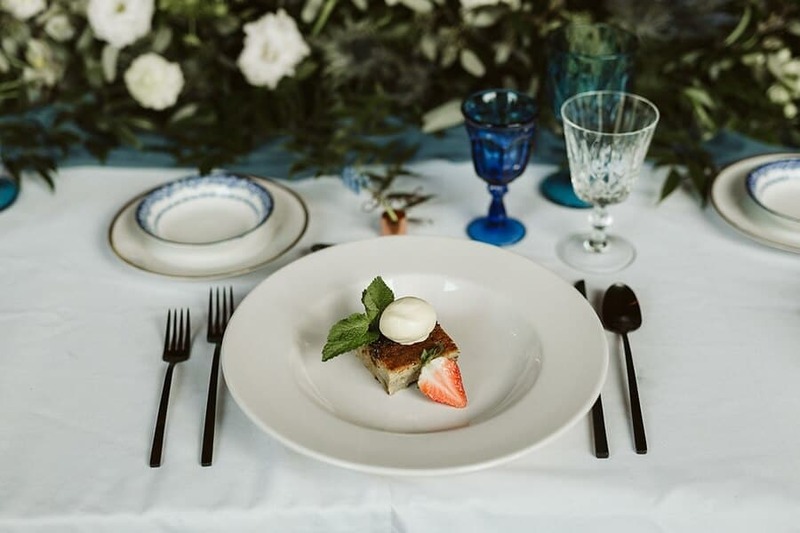 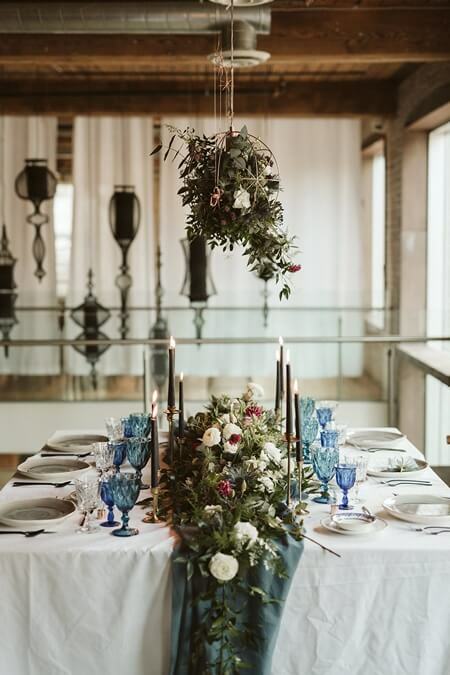 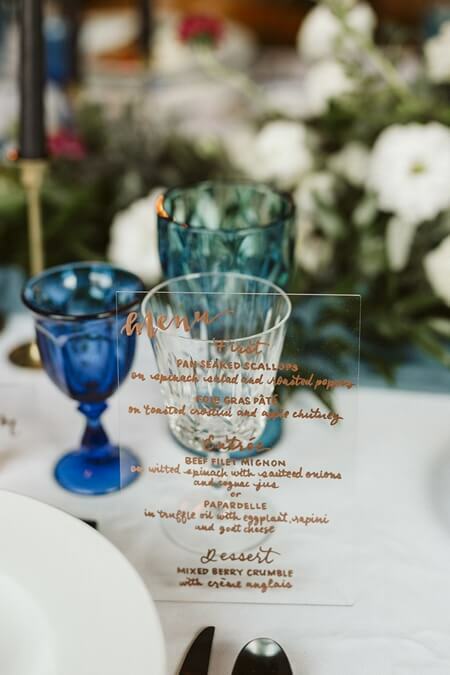 The tabletop décor from The Perfect Table also kept it simple providing off white plates with copper accents and glasses in different hues of blue. 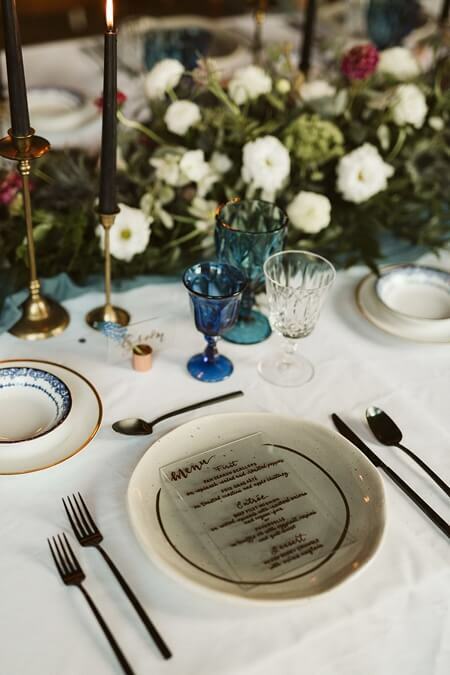 The white tablecloth was a classic choice, while the teal table runner added some colour and a modern twist that complemented the florals and glasses. 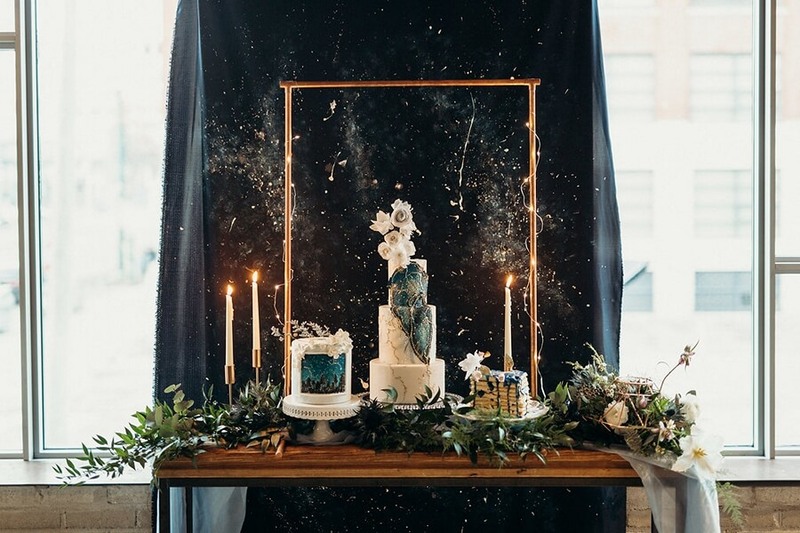 The mouth-watering entrées and desserts were catered by the team at Hotel Ocho. 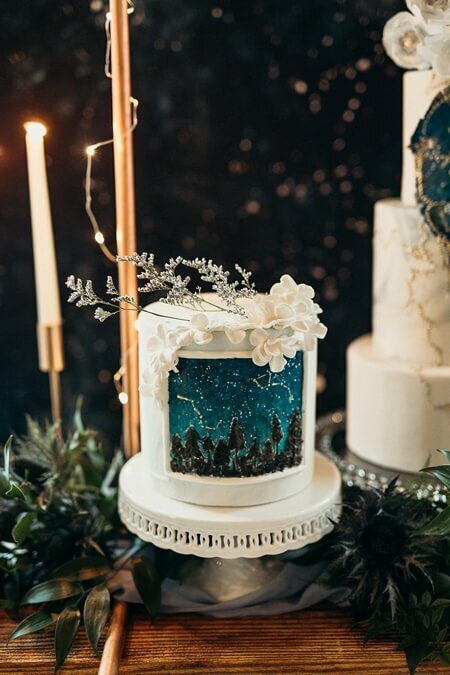 Cre8ive Studios‘ copper arch adorned with string lights and the galactic backdrop are the perfect way to showcase the divine cake designed by Cakelaine. 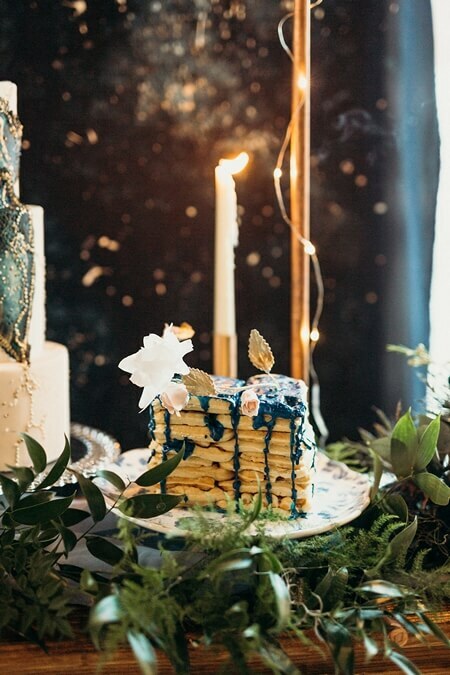 The three-tiered cake was decorated with golds, dark greens, deep blues and white florals to make it look out of this world. 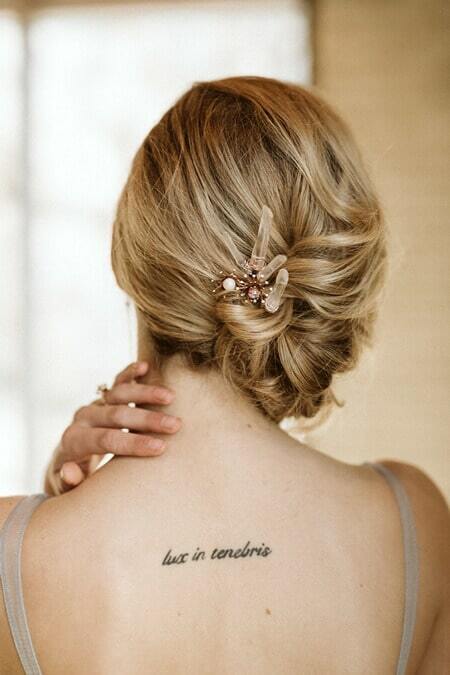 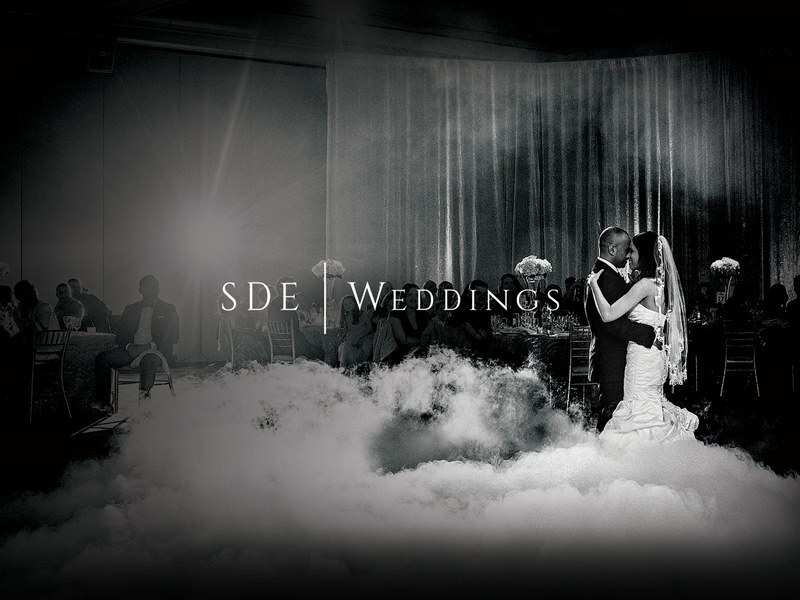 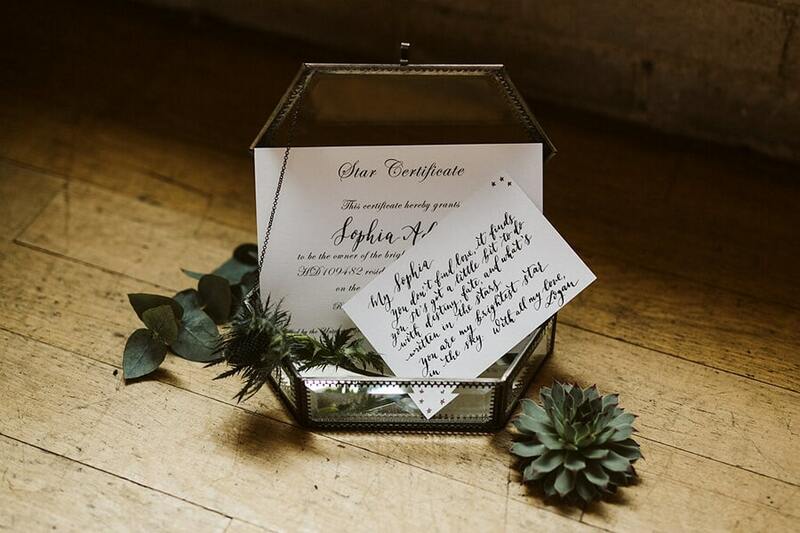 SDE Weddings captures more of this stunning creative on film.